Photo (approx. 5 x 7 inches) mounted in a folding cardboard frame/folder (I didn’t scan the whole folder). Photographer is Bue of Lanesboro, Minnesota. Otherwise undated and unidentified. This is another one of the ones my mom gave me for my birthday. I Googled the photographer and it appears to be this guy, a Norwegian immigrant named Mathias O. Bue. He operated his studio in Lanesboro from 1912 to 1946, so at the very least we can narrow the date of this photo to those years, though I think that would have been obvious anyway. I’m guessing it’s from somewhere right in the middle of that range, but other opinions are welcome. In any case, it’s a nice photo, I think. Salt of the earth, these folks, wouldn’t you say? Wonder why you keep picking out my favorites from that group? Well, you sparked my curiosity and sent me off on a brief flurry of internet searches. According to a couple of sites, button-down collars started on polo shirts with the intention of keeping the collars from flapping up into the players’ faces. (That seems funny to me since I don’t think of the contemporary polo shirt as having buttoned collars.) Button-down collars were mostly popular on sports shirts until the 1950s, so your mother was partly right about that, except that the first button-down collars on dress shirts were presented by Brooks Brothers in 1896. I think I did read that factoid a little while ago, but I wasn’t sure I believed it until now! I guess it’s safe to say that they were around for longer than they’ve been common. I think this is one of only two vintage photos I’ve ever seen that shows one (now they’ll be jumping out at me everywhere). Indeed, just because Brooks Brothers introduced them in 1896 doesn’t mean they were immediately popular. You know, the closer I looked at that guy’s collar, the more one of the ends didn’t seem very snug against his shirt, making me wonder if the button was on a loose thread, or even if they were just sewn on as decoration without function. But the other tip seems more securely fastened to his shirt, so it’s probably either loose, or a trick of shadows. Possibly the necktie is pulling it away from the shirt, too. Matt Bue was my great-uncle, and I remember him well. He lived with my family in his later years. I’ve seen this couple’s photo before but unfortunately I don’t know who they were. Mary, thank you for your comment! It’s wonderful to encounter a personal connection to a picture I post, and to get personal insight. 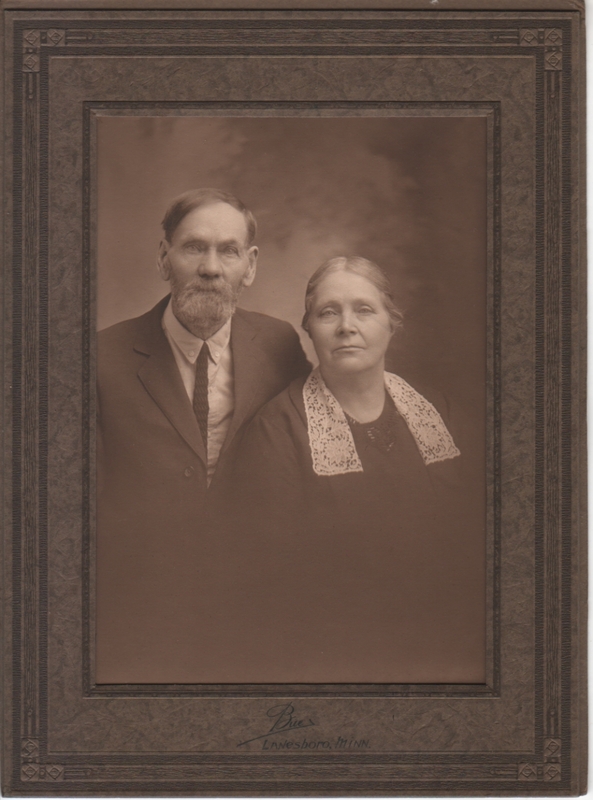 I suppose if you recognize the couple pictured, they may have been people your great-uncle knew, rather than just customers he photographed.